Historically Kashmir refers to an area of 86,024 square miles of the north-western region of the Indian sub-continent. 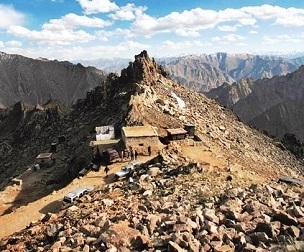 It refers to the area that includes the Indian occupied region of Kashmir Valley, Jammu and Ladakh, the Pakistani occupied regions are northern areas and Azad Kashmir and Chinese occupied region is referred to as Aksai Chin gifted away by the Government of Pakistan. In the 14th century, Islam was the dominant religion in Kashmir and leading the Sufi-Islamic way of life, Muslims and Hindus of Kashmir lived in relative harmony. Rinchen Shah from Tibet attacked and killed the last Hindu King Ram Chand and married his daughter Kuta Rani. Famous Sufi Saint Bulbul Shah (Abdul Rahman) was able to persuade the king of the time Rinchan Shah, later this prince of Kashgar Ladakh took the name of Saddaruddin Shah, through his intellectual power to adopt Islamic way of life and the foundation of Sufiana composite culture was laid when Muslims, Hindus and Buddhists co-existed in the atmosphere of love and brotherhood. Another spiritual Saint, Mir Saeed Ali Hamdani reverently known as Shah Hamdan, through his spititual powers influenced people to heed the call of Islam and due to the nobility in his person, a huge majority accepted Islam. Mir Syed Ali Hamadani came to Kashmir in 1372 and then again in 1379 and 1384 during the reign of Sultan Qutubbuddin. He and his 700 followers (desciples) gave the call of Islam which was accepted by a majority of Hindus and Budhists. This "heaven on earth" is in flames; its people, history, culture and beauty are being systematically destroyed, the world community, unfortunately is helplessly watching to see the generations wiped out and has done very little so far to help bring an end to the ordeal of Kashmir. Kashmiris by nature are non-violent, through centuries; they have lived peacefully in spite of the political intrigues and subjugation by outside forces and subjecting the whole population to torture, inhuman treatment and humiliation. About 13 million people live in Kashmir, of which around 70% are Muslims. The rest include Hindus, Sikhs, Buddhists and a small minority of Christians. Hindus live mostly in the south and around the city of Jammu. To the east is the Ladakh region, where the majority of the people are Buddhists and of Tibetan origin. Chairman Mao is quoted to be neutral as far as Kashmir imbroglio is concerned, at least it could be a factual position before or during the 'hindi chini bhai bhai (brotherly) affair' but after 1962 war won decisively by China, the whole political scenario changed dramatically. India after winning the war in 1971 with Pakistan creating a sovereign nation of Bangladesh disturbed the balance of power in the sub-continent, China befriending Pakistan supported it to become nuclear and succeeded in their plan to keep India busy and entangled with Pakistan leaving no time for India to worry about China. China busy building up their own economy and military might were uninterrupted to gain time to evolve a strategy to deal with the games played by big powers on the international level. At the outset to keep nuclear Pakistan under check as this might have repercussions in future for Pakistan to assume leadership of the Muslim world and become more powerful using the support and money thus provided by rich Islamic nations. To keep Pakistan under continuous pressure could create a fragmented Pakistan and or become a failed state that might force it to give up its nuclear program. A nuclear Pakistan is an impediment for the fulfillment of individual agendas of nexus of troika powers America, Israel and India. Most importantly in order to maintain the only super power status it is imperative to keep a vigil on recently defeated Soviet Union and emerging new super power China. This all allows control on economic resources of the world and to keep the state of Israel safe as Mahathir Muhammed said Israel is ruling the world by proxy. Apart from the areas occupied by India and Pakistan, China also has its share by occupying Aksai Chin and receiving Trans Korakaram Tract as a gift, a goodwill gesture from Pakistan for the services rendered. The countries involved use Kashmir to score their political points be it Pakistan's struggle to survive or India's meddling in Tibet affairs or China in retaliation claiming Arunachal Pradesh that India claims is hers. A new diplomatic tussle renewed due to issuing of visas on a separate sheet of paper to visitors from Indian occupied Kashmir or Arunachal Pradesh. China is reported saying 'Kashmir is a separate country'. An amazing similarity of exploitation by occupying powers across the cease-fire line should be an eye-opener having no parallel in history. People of Kashmir, on both sides, believe they have been betrayed, swindled, hoodwinked and humiliated. To draw a comparison, K H Khursheed was removed from ‘Azad’ Kashmir Presidents House and Abdul Hamid Khan appointed as the President. In spite of the opposition from political parties, Ayub Khan’s will was imposed on the people and after Ayub Khan the Government in Pakistan was taken over by Yahiya Khan. He appointed a very high official of the army Abdul Rahman as the President of Azad Kashmir. Later during Bhutto’s regime Abdul Majid Khan was appointed as the President and General Zia-ul-Haq appointed Major General (retired) Abdul Rahman, the Major General (retired) Hayat Khan and finally Sardar Abdul Qayoom Khan as President. In a nutshell Azad Kashmir has never had a government chosen by the people. In a similar fashion Sheikh Abdullah in Indian occupied Kashmir was removed to be replaced by Bakshi Ghulam Mohammad who later became a victim of Kamraj Plan and lost the chair to Ghulam Mohammad Sadiq and the process continued with installed puppets like Mir Qasim, Farooq Abdullah, Ghulam Mohammad Shah, Ghulam Nabi Azad, Mufti Syed and latest entrant is Omar Abdullah. At different times the political parties of India like Indian National Congress, Janata Party and Janata Dal etc extended their sphere in IOK and in an identical fashion the political parties like Awami League, Republican Party, Azad Pakistan Party, NPP, Peoples Party and Muslim League opened their branches in POK. The similarity of situation again coincides when India gives an impression to people of Kashmir that people of Jammu and Ladakh do not like to live with Kashmir and repeated by Pakistan that Gilgit and Baltistan have never been part of Kashmir. An earning of foreign exchange to the tune of 20 billion rupees annually does not yield any benefit for POK. IOK contributed a lot to put India on a world tourist map. Indian Tourism Development Corporation world wide would show films and blow up photos of Kashmir to would be tourists and once trapped the traffic would be diverted to central and south India. Mangla Dam electricity generation of nearly 1000 MW fulfilling the need of Pakistan’s electricity needs of nearly 35%, mostly used out of the country and no compensation has or is being paid, over and above the water used for irrigation purposes or Fish produced in the Mangla Dam is also consumed free of charge. This is reminiscent of Salaal project in Indian occupied Kashmir the contribution that it makes to Government of India. Since 35 years of its commissioning not a single penny has been paid to IOK. Yahiya Khan Regime’s act of 1970 extended to POK was replaced by the new 1974 Act. A new department by the name of “Kashmir Council” came into force and the Prime Minister of Pakistan as its Chairman. A few departments are there that cannot be interfered with by the Government of POK. The Prime Minister of POK cannot make the decision about distribution of electricity and on the contrary decision lies with “Kashmir Council”. This Council also controls income tax and excise departments. The issue of State Subject certificate to bona fide people is the prerogative of the Council alone. Sheikh Abdullah, like numerous occasions, on a visit abroad in 1965 met Col Nasser of Egypt, Ben Bella of Algeria, Premier Chow En Lei of China and Shah Faisal of Saudi Arabia and exchanged views about solving the complex problem of Kashmir. It did not go very well with India and on his return his passport impounded and banished to south-Indian city of Kodai Kanal. Likewise authorities in POK have also been dealing with the leaders like Sardar Ibrahim, K H Khursheed, Syed Abdul Wahid Bukhari and the rest in the same fashion putting restriction on their movements or any political activity. Gilgit-Baltistan has been no different and has been ruled by an ‘Agency System’ aided by draconian laws like F.C.R. Political activity is unheard of in these areas. Now Pakistan’s so called ‘democratic’ government headed by Zardari allowed elections process to choose a government of people but without conferring a ‘Province’ status. However, many believe that the rigged elections allowed Zardari’s Pakistan Peoples Party eleven seats. Sheikh Basharat Ahmed of Muslim Conference wrote a book titled “Real Azad Kashmir” during K H Khursheed’s rule; he was confined to his residence for many months. Likewise, a book written by Late Major Raja Abas Khan, “Azad Kashmir needs attention” exposing the Government committing atrocities on people, was banned. Hijacking of Ganga passenger aircraft in 1971, initially misunderstood by excited Z A Bhutto who welcomed hijackers as heroes, later led to indiscriminate arrests and a manhunt of various organisations like Mahaaz-I-Azadi, Plebiscite Front etc. and a huge number of supporters arrested and put behind bars using draconian laws to put curbs on lawful protests and demonstrations as soon afterwards he and his Government understood the game plan of India, hijacking exercise that later fulfilled India’s objective of creating Bangladesh. History is witness that religious differences those played havoc in Kashmir be it Shia-Sunni, Sheer-Bakra or Hindu-Muslim animosity always brought destruction. Nearly four hundred years back Mogul Emperor Akbar used his military might at least eight times to subjugate Kashmir but failed and succeeded only when he managed to create a difference between Shia-Sunni and a delegation of one sect offered its allegiance and requested Akbar to give them a government so that they get some peace. This has been repeated many times over by outside forces to divide and rule Kashmir. Pakistan’s President General Zia-ul-Haq declared Kashmir’s Northern Areas as Pakistan’s territory, a step vehemently opposed by the people of POK and Gilgit-Baltistan but Zia-ul-Haq and the Government turned a deaf ear. During these days it was apprehended that with the passage of time these areas will be accorded status of a province that would make it a province of Shia dominance ringing the alarming bells throughout the State. Then on May 18, 1988 a bloody drama was enacted when forty thousand Afghan warriors equipped with American weapons and armament were allowed to pounce on Gilgit and this army marched towards Dir, Swat and hilly links of Indus. The first village that came under attack was Skwar hardly half a mile distance from Pakistani army cantonment and Pakistani Officers commanding watched this all as spectators. These Afghan warriors committed loot and plunder continuously for five days and destroyed nearly 1200 houses and this all was done with the blessings of Government of Pakistan. The news of this barbaric act reached Pakistan army barracks having 90% local recruits, controlled by Pathan or Panjabi Officers, created dissent and nearly a rebellion when the top brass of the army tried to persuade the raiders to retreat even paying them huge sums of money as bribe. And this all was done under the very nose and instructions issued by General Zia-ul-Haq. Azad Jammu and Kashmir (Pakistan occupied Kashmir), the narrow southern part, 250 miles (400 km) long, with a width varying from 10 to 40 miles (16 to 64 km). Gilgit-Baltistan formerly called Federally Administered Northern Areas (FANA) is the much larger area to the north of AJK, 72,496 square kilometers (27,991 sq mi), it was directly administered by Pakistan as a de facto dependent territory, i.e., a non-self-governing territory. However, prevailing a better sense, it was officially granted full autonomy on 29 August, 2009. An area of Kashmir that was once under Pakistani control is the Shaksgam tract, a small region along the northeastern border of the Northern Areas that was provisionally ceded by Pakistan to the People's Republic of China in 1963 and which now forms part of China's Uygur Autonomous Region of Xinjiang. 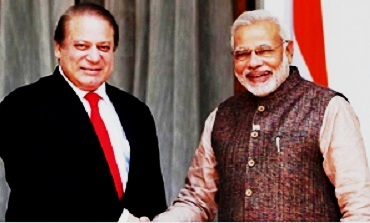 It is an irony that Nawaz Sharif banks on the support of Indian prime minister Modi to stay in power in Pakistan. Pakistan understands that the enemy within is more dangerous than nuclear power armed to teeth India. Nawaz Sharif at the moment is between devil and the deep sea and in a fix to work out an escape from current political dilemma. There is a word around that India has invested billions in Nawaz Sharif. The military victory in Kargil under the command and control of Pakistan's army chief General Musharraf was turned into a polital defeat by fifth column prime minister of Pakistan Nawaz Sharif. Prime Minister Nawaz Sharif, unfortunately for Pakistan, indulged in corruption on a very high scale supported by nepotism to put all his relations and partners in corruption in key positions and bureaucracy to keep firm control on running the government. Since all his looted assets are invested in western capitals mostly in real estate has weakened his position to safeguard his contry´s national interests. Nawaz Sharif facing Supreme Court of Pakistan for his corruption charges is bent on putting his country at stake to save himself and his family. This is nothing unusual but an exercise that has become a routine right from 1947. This may not be the voice of the majority of people in Kashmir but people on the whole consider this as the second option after independence. Kashmir feels betrayed as temporary help offeredby Pandit Nehru cost people of Kashmir dearly according them huge loss in men and material. Another opportunity provided by mediation of Soviet Union on January 10, 1966 to solve Kashmir dispute was not to be as untimely death of Indian Prime Minister, Lal Bahadur Shastri came as a rude shock. Like Pandit Nehru, Prime Minister Shastri's death in Tashkant was termed as "mysterious". The patriotism of Nawaz Sharief and Zulfikar Ali Bhutto´s family rule, or even some fifth column religious outfits leave a big question mark. The uneducated and economically downtrodden Pakistan has been unlucky and vote these so called leaders to power giving them opportunity to mess up Pakistan. ZA Bhutto, perhaps inadvertently, proved instrumental in creating Bangladesh. He could not have been oblivious of Indian clandestine plan using its resources and connections in the eastern wing to secede it from West-Pakistan. Benazeer Bhutto for some unknown reasons helped India to crush Khalistan movement which unfortunately resulted in genocide committed by India in Indian Punjab. Ms Bhutto chose to hand over all the files of Sikh militants fighting for independent Khalistan. During General Zia-ul-Haq´s rule when India and Pakistan had no diplomatic relations, Shahnawaz Bhutto was seen busy shopping in Delhi´s Connaught Place escorted by Indian intelligence agencies. Soon it came to light that Shahnawaz was a special guest at Indira Gandhi´s official residence 1 Safdarjung road New Delhi sharing the bed room of his close friend Sanjay Gandhi. Both these friends died a brutal death, the former was found dead in a hotel in Nice, France and the latter died in an air-crash. History is replete with atrocities committed on Kashmiris who have been targeted by invading forces with the main aim to indulge in loot and plunder. One of this ruthless barbarian tribe Khokh or Jotha came through Korakaram, Himalayas route and subjected the local population to torture and humiliation. Kashmiris do remember Khokh as even today a mother trying to put her child to sleep or wanting the child to be quiet and behave, would warn the child that Khokh are approaching and this would work. These invading rulers also found defenseless people of the valley as soft targets and because of these harsh realities people developed a habit of being tolerant, forbearing and receptive to inhuman treatment. Durranis rule has been another worst experience of people of the valley. A phrase, "pog moghul", frequently used by Kashmiris to describe someone despised, scorned or hated and stems from the resilience and buoyancy displayed for nearly nine battles fought with the Mughal Emperor Akbar that brought death, famine and poverty. This "great" Mughal emperor fought two full scale wars with then Kashmir ruler Yousuf Shah Chak (Oct,1586) and Akbar was miserably defeated on both occasions due to difficult mountain terrain and the valour King Chak's forces fought with. Soon after he cunningly offered the Chak king a hand of friendship and invited him to Delhi. Yousuf Shah was warned by his advisers especially by his wise queen Habba Khatoon not to fall into a trap but the King decided to see Akbar in the wider interest of people to spare them from further bloodshed and destruction of his country. He was betrayed by Akbar and imprisoned in Muzaffarpur,Bihar, India where he died and was later buried. Soon after Mughal's managed to rule Kashmir which lasted till 1750 A.D. Akbar's revenue minister, Todar Mal carried out the first revenue settlement in Kashmir. He built the great wall of Sangin/Kathi darwaza around the base of Hari Parbat soon after 1592. A huge majority of people in India and Pakistan are peace loving and feel that animosity and hatred, created by religious zealots on both sides in general and politicians to stay in power in particular, caused lot of damage to a common man. The saner elements on both sides are busy making an effort to bring two people together to create an atmosphere of friendly and brotherly relations and all realise that Kashmir problem has been hanging in balance for a long time and needs to be resolved as per the wishes of the people of Kashmir. The prevailing situation is a direct result of two nuclear countries fighting wars and people of Kashmir as such has had no role to play to complicate the situation. For Sardar Patel supported by like minded V.P.Menon, M.C.Mahajan and the ilk, the State of Jammu & Kashmir had become for all time an integral part of Indian Union. The job distribution of political wrangling was carefully thought out and the dirty role was ingeniously handled by resourceful V.P.Menon and M.C.Mahajan. Nehru's initial utterances or commitments were a direct result of Governor-General Lord Mountbatten's developed understanding with Pandit Nehru on the issue and perhaps a pre-condition for supporting airlifting of Indian Army to Srinagar airport. People of Pakistan have failed to understand their prime minister Nawaz Sharif and his family, a leader of main political party to betray a nation, his motherland which gave him honour, respect and even allowed him to commit loot and plunder. Sharif went even a step further by stabbing poor Kashmiris in the back. 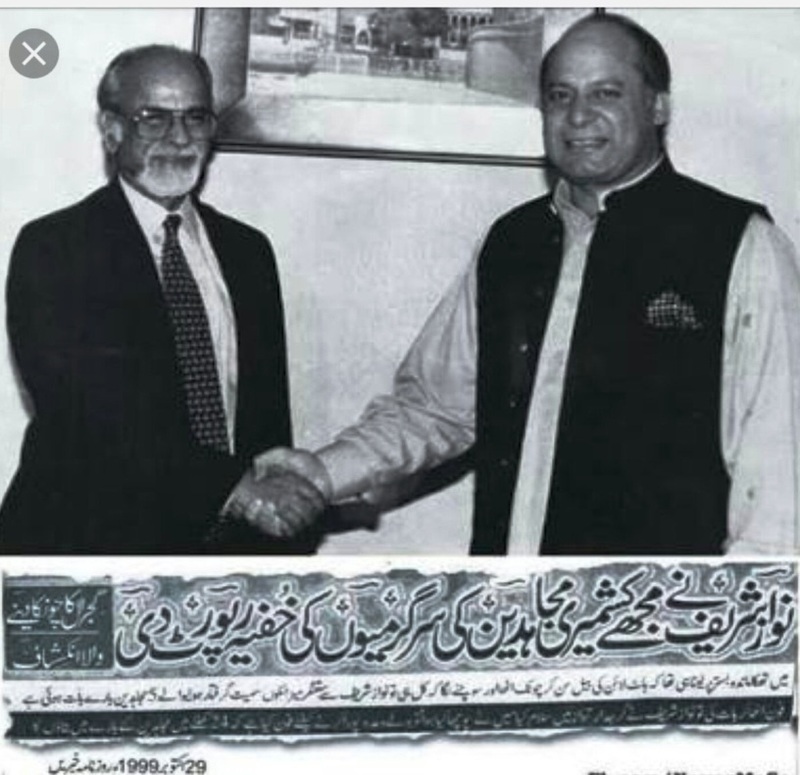 It is reported in the media that Indian prime minister late I.K.Gujral revealed that Nawaz Sharif handed him full intelligence report on Kashmiri freedom fighters engaged in a war with Indian occupational forces. On receiving the information Indian army in Kashmir went on a murder hunt and killed thousands wherever they found them. 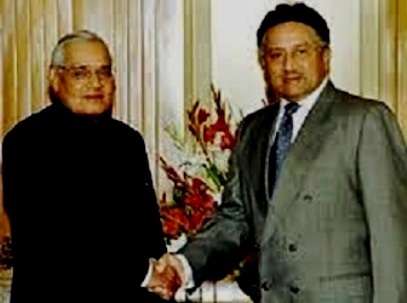 Gentleman ex-prime minister of India Atal Bihari Vajpayee, as believed, showed the sincerity of purpose and engaged in a dialogue with Pakistani President Pervez Musharraf to find a solution to long standing Kashmir problem. An attempt that was welcomed by all quarters except the Indian army which scuttled the move to leave Kashmir simmer again till someone in India was bold enough and honest to take a decision in the right direction. Kashmir all agree needs a solution and sooner or later it has to happen.